Ticket includes a lite bite and one beverage. Ticket price includes all fees. 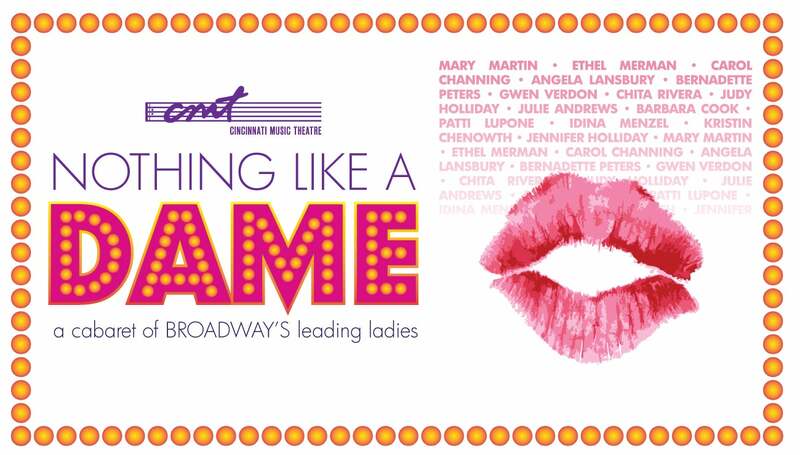 Celebrate Broadway’s legendary leading ladies -- from Mary Martin and Ethel Merman to Idina Menzel and Kristen Chenoweth -- with NOTHING LIKE A DAME, the sparkling new cabaret production from Cincinnati Music Theatre, with support from the Cincinnati Arts Association. A cast of some of Cincinnati’s finest theatre talent will perform memorable musical moments from the Golden Age of Broadway, right up to today’s contemporary hit shows, including Anything Goes, The Sound of Music, Gypsy, Evita, Into the Woods, and Wicked. A charming master of ceremonies will share interesting facts and amusing anecdotes about these beloved Broadway dames, whose personalities and talents created stage legends and transcended marquees. NOTHING LIKE A DAME is conceived and directed by Skip Fenker, with musical direction and arrangements by Michael Spresser, the same team who created CMT’s first sold-out cabaret, LOVE IS LOVE, in February.